Other photos: 40' Intrepid 2018- Profile, 40' Intrepid 2018- Profile, 40' Intrepid 2018- Profile, 40' Intrepid 2018- Profile, 40' Intrepid 2018- Profile, 40' Intrepid 2018- Profile, 40' Intrepid 2018- Profile, 40' Intrepid 2018- Profile, 40' Intrepid 2018-Salon, 40' Intrepid 2018- Galley, 40' Intrepid 2018- Berth, 40' Intrepid 2018- Head, 40' Intrepid 2018- Head, 40' Intrepid 2018- Helm Station, 40' Intrepid 2018- Helm Station, 40' Intrepid 2018- Helm Station, 40' Intrepid 2018- Helm Station, 40' Intrepid 2018- Helm Station, 40' Intrepid 2018- Helm Station, 40' Intrepid 2018- Helm Station, 40' Intrepid 2018- Helm Station, 40' Intrepid 2018- Helm Station, 40' Intrepid 2018, 40' Intrepid 2018, 40' Intrepid 2018, 40' Intrepid 2018, 40' Intrepid 2018, 40' Intrepid 2018, 40' Intrepid 2018, 40' Intrepid 2018, 40' Intrepid 2018, 40' Intrepid 2018, 40' Intrepid 2018, 40' Intrepid 2018, 40' Intrepid 2018, 40' Intrepid 2018, 40' Intrepid 2018, 40' Intrepid 2018, 40' Intrepid 2018, 40' Intrepid 2018, 40' Intrepid 2018, 40' Intrepid 2018, 40' Intrepid 2018, 40' Intrepid 2018. Sleek and stylish, the 407 Cuddy offers all the enhanced accommodations you would expect in a luxury performance cruiser. From a private head with shower stall and separate master berth with queen bed and hullside windows to a forward cabin section that easily converts to a large double berth. But none of it comes at the expense of the most advanced technology and fabrication techniques that deliver an incomparably smooth, dry ride with unparalleled performance. For divers and swimmers, it’s packed with thoughtful design features like a hullside dive door with step ladder and grab rails. 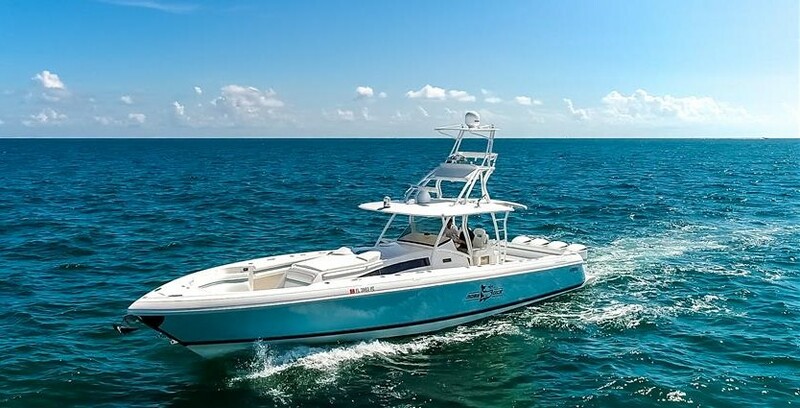 Entertaining is elevated with cozy, custom seating and a stylish wet bar while serious sport fishermen will take note of the baitwells, rod holders, tank storage, tackle boxes and raw water washdown.